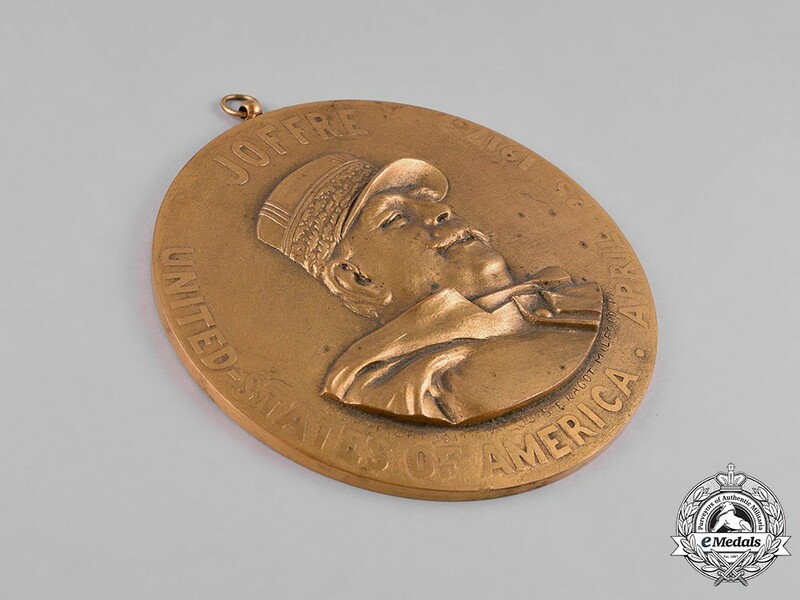 In brass, weighing 390 grams, illustrating the right-facing bust of French Marshal Joseph Jacques Césaire Joffre, marked ""COPYRIGHT 1917 BY LOUIS F. RAGOT. 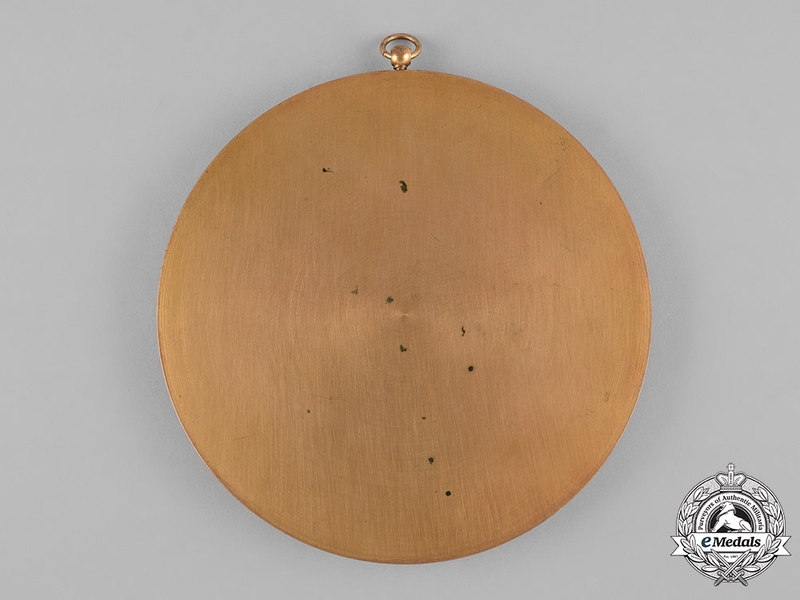 MILFORD PA." below the bust, inscribed "JOFFRE" above and surrounded by the inscription "UNITED STATES OF AMERICA - APRIL 25 1917", measuring 111.5 mm in diameter, ring suspension, edge nicks, spotting, near extremely fine. Footnote: On April 1, 1917 Prime Minister Ribot of France asked Marshal Joseph Jacques Césaire Joffre to go on René Viviani's mission to the United States. There was already a similar British mission being prepared, led by Arthur Balfour, Foreign Secretary and a former Prime Minister. The French along with the British had been preparing to do so since February, after the announcement of the severance of diplomatic relations between the United States and Germany, in the expectation that an American declaration of war against Germany was imminent. He was initially reluctant to go as the Nivelle Offensive was underway. On April 6th, the United States Congress declared war on Germany. The main problem for their new army would be training men and, especially, officers. 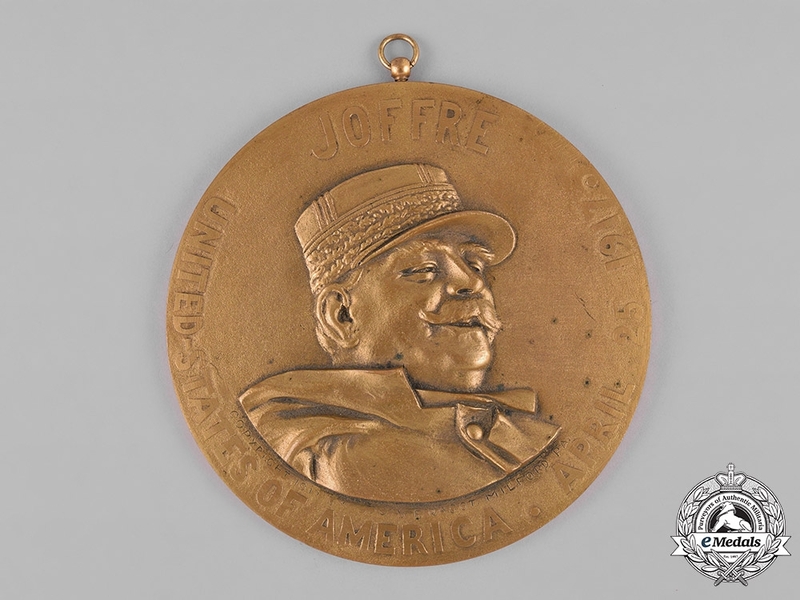 Joffre initially considered recommending the incorporation of American companies and battalions into the French and British armies, but realized that the Americans would never accept this. The party sailed to the United States on the Lorraine II, making an effort to cultivate reporters on board, who noticed how busy Joffre kept his small staff. While at sea he learned of the failure of Nivelle's offensive. He landed on April 24th at Hampton Roads, where he was welcomed by Admiral Henry Mayo, commander-in-chief of the US Atlantic Fleet, Ambassador Jean Jules Jusser and and Assistant Secretary of the Navy Franklin Roosevelt. He arrived in Washington the following morning, where he met Secretary of State Robert Lansing and Arthur Balfour. Joffre stayed in Washington for ten days, and addressed both Houses of Congress individually. On April 27th, he met Army Chief of Staff Hugh Scott and his deputy, Tasker Bliss. Joffre recommended sending a single American unit to France at once and requested that the Americans send railroads, automobiles and trucks for the French Army. On April 30th, the British Major-General Bridges lobbied for United States troops to be used to reinforce the British Army, arguing this would lessen the language and food differences. Joffre left a paper arguing for a separate American force, then on May 4th, began a week's tour of the eastern United States. In full view of the press, he waited his turn in a barber's shop in St. Louis for a haircut, visited the hometowns of Abraham Lincoln (Springfield, Illinois) and Ulysses Grant, laid wreaths at the statues of Joan of Arc and Lafayette, and visited West Point. He returned on May 10th, to find that the American authorities agreed with the recommendations in his paper. The 1st United States Infantry Division, mainly regulars, was to be sent at the start of June. On the last day of his visit to Washington, Newton D. Baker, the secretary of war, introduced him to General John J. Pershing, just selected to command the American Expeditionary Forces (AEF). Joffre told him that ""he can always count on me for anything in my power."" On June 13th, Pershing, who had landed at Boulogne that morning, met Joffre, Paul Painlevé (war minister), Viviani and Foch (chief of staff) in Paris. Joffre recommended that an American unit be rushed to France to show the flag. 2nd Battalion, 16th Infantry Regiment was sent, and was reviewed by Joffre and President Poincaré as it marched up the Champs-Élysées on July 4th. Pershing rejected Painlevé's suggestion that Joffre head the liaison group of French officers who were helping to set up his supply lines; Pershing insisted on using the Atlantic ports of Brest, St Nazaire and Rochefort.